People were rushing to buy the Burnley Express that day as the front page headlined with ‘Turf Moor take-over moves?' which was followed by the opening sentence above suggesting a move into the transfer market. 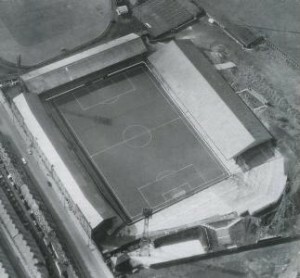 No, there were no new players coming in, and Bob Lord certainly wasn't ready to sell his shareholding either, but he was trying to extend the club by buying out the cricket club next door in a move that would pave the way for Turf Moor to be transformed into one of the best and most progressive football grounds in English football. It sounded to be superb news for the Clarets, who at the time were in seventh place in the First Division and just four points behind leaders Chelsea, but there was a quick response that Lord was not prepared for from his counterpart next door, Chairman of the cricket club Harry Langton. “The idea of the cricket ground being taken over is both fantastic and laughable,” he said and in response to Lord added, “All I can say is that I am highly amused and that we know nothing of a big bid for our ground from the football club. That strip of land was an area of 30ft behind the then cricket field end structure running the full width of the stand, approximately 360ft. This would allow for one of the floodlight pylons to be re-sited, and it was thought that the cricket club would be willing to negotiate a sale of this small strip of land. Lord of course wasn't having any of it and hit back at Langton and outlined his plans. “We will be making a definite start on development next spring and this will not necessarily be at the Bee Hole End where a social club and new stand are planned,” Lord revealed. He explained further, “We have lots of ideas, big ideas. In five years time Turf Moor will be unrecognisable from what it is today. Langton retorted, claiming the cricket ground to be worth over half a million and that no matter what there was no chance of it being sold to the football club. He joked that they might want it for a bigger car park. Bob Lord never got the cricket ground, he didn't even get the strip of land he wanted, but by 1970 he had purchased a part of the ground that ran alongside Brunshaw Road up to the scoreboard which was then situated on the corner by the traffic lights. That was to build shops, a social club and a night club that was set to be the biggest in the north west, it was all set to take Burnley forward as a top club. The drawings, made public, showed the name of Shirley Bassey, then a top star, as appearing. None of that was ever built, and it became, as Langton had predicted, nothing more than a car park, and to this day it remains as just that, a car park. Who said that Bob Lord always got his own way?